He was hit by a bomb dropped by an Israeli fighter jet Wednesday night east of al-Shuja’eyya neighborhood, in the eastern part of Gaza City. Israeli forces stationed at the border then fired at least five shells east of Gaza City in al-Shejaiyya and al-Zaytoun neighborhoods. A Palestinian was moderately wounded by the shelling and taken to Shifa Hospital in Gaza City. Israeli forces continued with systematic crimes in the occupied Palestinian territory (oPt) for the week of 05 – 11 April, 2018. Israeli forces continued to directly target peaceful protests along the Gaza Strip borders without their posing any threat to the Israeli soldiers’ lives. 8 Palestinian civilians, including 2 children and a photojournalist, were killed, while 3 others succumbed to previous wounds. 608 Palestinian civilians, including 80 children, 8 women, 4 journalists and 6 paramedics, were wounded in the Gaza Strip. Israeli forces excessively used lethal force against Palestinian civilians, who participated in peaceful demonstrations organized on the 42nd anniversary of the Earth Day, particularly in the Gaza Strip, which witnessed peaceful demonstrations along the eastern Gaza Strip border area, where ten thousands of defenseless Palestinian young men, women, children, and elderlies participated. On 06 April 2018, the Gaza Strip witnessed another bloody day since the beginning of the Great March of Return and Break Siege activities as 9 Palestinian civilians, including 2 children and a journalist, were killed while 3 other civilians succumbed to their wounds they sustained on the first Friday of the Return March. Moreover, 608 others, including 80 children, 8 women, 4 journalists and 6 paramedics, sustained wounds, mostly classified as serious. The protesters’ activities continued during the reporting period and the Israeli forces continued to daily target them along the Gaza Strip border area. Since the beginning of the March, the death toll has amounted to 27, including 3 children and a journalist. In the West Bank, a Palestinian civilian from Balata refugee camp, east of Nablus, was shot dead by an Israeli settler near “Mishor Adumim” settlement, east of occupied East Jerusalem while a Palestinian prisoner succumbed to wounds he sustained last week when officers of an Israeli security company working for the Israeli forces opened fire at him. Moreover, the Israeli forces killed 7 Palestinian civilians, including 4 children, sustained various wounds. This high number of casualties in the Gaza Strip proves that the Israeli forces continue to commit crimes and use excessive force against Palestinian civilians in disregard for their lives and upon an official political decision. PCHR indicates that according to Israeli forces’ spokesperson on his Facebook page, the Israeli forces prefigured the demonstrations, whose organizers previously declared they would be peaceful, sending threatening messages to intimidate the organizers and Gaza Strip residents and deploying Israeli snipers along the border fence. In addition to those killed mentioned above, on 05 April 2018, medical sources at the Gaza European Hospital in Khan Younis declared the death of Shadi al-Kashef (34), who is deaf-mute from al-Shokah village, east of Rafah, succumbing to wounds he sustained on 30 March 2018 during his participation in the Great March of Return and Break the Siege” in al-Shokah village. 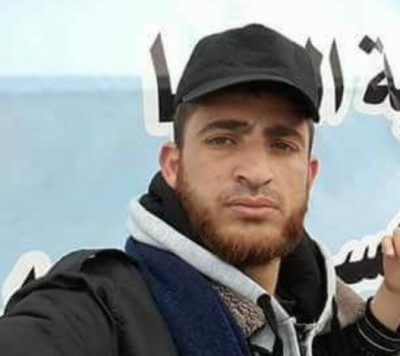 On 06 April 2018, medical sources at al-Shifa Hospital in Gaza City declared the death of Thaer Rab’ah (30) from Jabalia refugee camp in the northern Gaza Strip after succumbing to wounds he sustained on 30 March 2018 during his participation in the Great March of Return and Break the Siege” in Eastern Jabalia. On 09 April 2018, medical sources at the Gaza European Hospital declared the death of Merwan Qudeih (45) from Khuza’ah village, east of Khan Younis, succumbing to wounds he sustained on 30 March 2018 when the Israeli forces targeted the demonstrators in the vicinity of the sit-in spot. it should be mentioned that Qudeih was married and father of 7 children. The Israeli forces stationed 30-70 meters away from the border fence and the closest point the protesters reached did not exceed 50 meters to the west of the border fence. Thus, the distance between the Israeli soldiers and protesters cannot in any way pose any threat to the Israeli soldiers’ life, especially the demonstrators were unarmed. PCHR confirms that the Israeli forces directly targeted a number of field activists, who usually exist along the border fence in any peaceful protest, as 3 of them were killed in the northern Gaza Strip. PCHR’s investigations indicate that all those killed were shot to the head, neck, chest, and abdomen. One of them was hit to the back of the head. This proves that the Israeli forces deliberately caused disabilities to the demonstrators as most injuries were in the knee. Through dealing with those wounded, Medical sources at the Gaza Strip hospitals stated that most of those wounded with live bullets suffered serious tissue laceration and large holes in the wounded part, proving that the Israeli forces used explosive bullets. As part of targeting the border areas, in the central Gaza Strip on 07, 08, 09, 10 and 11 April 2018, Israeli forces stationed along the border fence between the Gaza Strip and Israel opened fire at the agrictural areas and shepherds 10 times. The targeted areas included eastern areas of Deir al-Balah, al-Maghazi, al-Bureij, Gaza Valley village (Johr al-Deek) and in the vicinity of the Landfill. Howoever, no casualties were reported. On 11 April 2018, Israeli forces stationed along the border fence between Israeli and the Gaza Strip in al-Ahmar Area, east of Beit Hanoun in the northern Gaza Strip opened fire at the border area, forcing the farmers to leave fearing for their life. Neither causalities nor damage to property was reported. On the same day, Israeli forces stationed along the border fence between the Gaza Strip and Israel fired several artillery shells at the agricultural areas, east of al-Zaytoun and al-Shuja’iyah neighbourhoods, east of Gaza City. No casualties were reported. As part of the Israeli airstrikes, on 09 April 2018, Israeli warplanes carried out 2 airstrikes launching 4 missiles at two sites belonging to Hamas Movement in the northern Gaza Strip. Both sites sustained damage, but no casualties were reported. The explosion rocked all the area, causing civilians to panic, particularly women and children. As part of targeting fishermen in the sea, the Israeli forces continued to escalate their attacks against fishermen in the Gaza Sea, indicating to the on-going Israeli policy of targeting their livelihoods. During the reporting period, PCHR’s fieldworkers monitored 4 shooting incidents; 2 in north-western Beit Lahia and 2 in Western Soudaniyah, west of Jabalia in the northern Gaza Strip. In the West Bank, on 08 April 2018, a Palestinian civilian namely Mohammed ‘Anbar (46) from Tulkarm succumbed to wounds he sustained after officers of an Israeli security company opened fire at him at Jubarah checkpoint, south of Tulkarm, on 02 April 2018. Immediately after his injury, he was arrested by the Israeli forces and then taken to “Meir Hospital” in Kfar Saba City in Israel where he stayed until his death was announced. On 09 April 2018, the Israeli authorities informed the family of Mohammed Marshud (31) from Baltah refugee camp, east of Nablus, that he succumbed to wounds he sustained after an Israeli settler opened fire at him near “Mishor Adumim” settlement in al-Khan al-Ahmar area, east of occupied East Jerusalem. The settler opened fire at the abovementioned civilian when the latter the day before attempted to stab another settler with a tool he had with him. However, no local eyewitness was available in the scene when the crime occurred. Thus, referring to the actual facts and two statements by the Israeli police, the settler could have used less deadly force, neutralized him and then handing him to the police for interrogation, particularly that Marshud was not armed and so it would be easy to control him. On 09 April 2018, a child was seriously wounded when Israeli forces opened fire at Palestinian children who protested against them following the Israeli incursion into Tal village, southwest of Nablus. In addition to the abovementioned injury, during the reporting period, 6 Palestinian civilians, including 3 children, were wounded after Israeli forces opened fire at them and fire tear gas canisters directly during peaceful protests and stone-throwing at the Israeli soldiers stationed at the entrances to the Palestinian communities in the West Bank. Those demonstrations came in the light of demonstrations organized by Palestinian civilians in protest at the Trump’s decision to recognize Jerusalem as the capital of Israel, the Israeli forces’ ongoing settlement crimes and confiscation of Palestinian lands, and on the 42nd anniversary of the Earth Day (Land Day). As part of seizing Palestinian property for the interest of settlement associations, Elad settlement foundation, in twisted ways, took over 3 houses belonging to Reweidi Family on al-Ein Street in Silwan village, south of occupied East Jerusalem’s Old City. Eyewitnesses said to a PCHR’s fieldworker that dozens of Israeli soldiers accompanied with workers raided the houses and expelled the residents after evacuating all the houses’ contents. The family emphasized that they did not receive any eviction order and that they have been trying for 2 years to prove their ownership of the houses before the courts. The first house belonged to Khaled Rweidi and his brothers and rented by ‘Ata Rweidi; the second house ,where Rezeq Rweidi’s wife lived along with her sons and grandsons, belonged to heirs of ‘Atalah Soliman Rweidi; and the third one belonged to Feisal Rweidi and sheltered 13 individuals. On 10 April 2018, Israeli forces backed by military vehicles, and accompanied with 3 vehicles of the Israeli Civil Administration and a mounted-crane truck moved into Kherbet Zanoutah, southwest of al-Dahiryia village, south of Hebron. After that, Israeli workers, who accompanied the Israeli forces, dismantled and confiscated the contents of Somoud and Tahadi School established by the Kherba residents in cooperation with ACF. The school was built on an area of 120 square meters and included 6 classrooms, an administration room, a kitchen and bathroom, and 2 water tanks. The Israeli Civil Administration officers handed the school a notice to stop the construction works and a list of confiscated items before leaving. It should be noted that Kherbit Zanoutah is located near “Shim’a” settlement and bypass road (60) that connects the Israeli settlements established on the southern lands of Hebron and northern West Bank. Kherbit Zanoutah is an agricultural community inhabited by 26 families, including 180 people. Kherbit Zanoutah is exposed to a fierce campaign by the Israeli authorities, including the destruction of its wells and barrack demolition notices many barracks. On 10 April 2018, Israeli bulldozers demolished an under-construction residential house in al-Qastal al-Jabaliyia area in Jebiyia village, northwest of Ramallah, under the pretext of non-licensing. The house belongs to Ghazi Mohamed ‘Ali Hejazi (58), from Kafur ‘Aqoub village, north of occupied East Jerusalem. Ghazi said that he started building his 250-square-meter house on 10 January 2018. He added that the house is surrounded by a fence built of bricks and he attempted to get a license from the Israeli authorities, but in vain. It should be noted that house was supposed to shelter 8 persons. On Monday evening, 09 April 2018, Israeli authorities informed the family of Mohammed Abdul Karim Marshud (31), from Balata refugee camp, east of Nablus, Mohammed succumbed to wounds he sustained after being shot by an Israeli settler near “Mishor Adumim” settlement in al-Khan al-Ahmer area, east of East Jerusalem. At approximately 13:15 on Sunday, 08 April 2018, an Israeli settler opened fire at Marshud near al-Khan al-Ahmer Petrol Station after Marshoud attempted to stab another Israeli settler with a tool he was holding in his hand. As a result, Marshud was hit with several live bullets and then transferred to Hadassah Ein Kerem Hospital in West Jerusalem and his medical condition was critical until his death was announced on the next day morning. The Israeli police spokesperson said in a statement: “According to preliminary investigations near a petrol station in “Mishor Adumim”, a suspect arrived and attempted to stab an Israeli in the area. Meanwhile, another Israeli who was in the area and saw the incident opened fire at the suspect and he was naturalized.” In a later statement by the Israeli police spokesperson said: “at approximately 13:15, the police was called to the “Mishor Adumim” intersection near a petrol station after receiving a call about an attack carried out by a suspect, who was holding a screwdriver and started running after an Israeli and attempted to stab him. Anther settler, who was driving his car on Street No. (1), saw the suspect, so he stopped his car, ran after him and opened fire at him wounding him seriously.” No local eyewitnesses were in the crime scene. Due to the actual facts and the Israeli police statements, the settler, who shot Marshud could have used less lethal force against him to naturalize him and then hand him to the police for interrogation, particularly that he was unarmed. At approximately 01:00 on Thursday, 05 April 2018, dozens of Palestinian protestors gathered near the border fence between the Gaza Strip, east of al-Buraij in the central Gaza Strip as part of the activities of the Great March of Return and Breaking the Siege established. The protestors threw stones at Israeli soldiers stationed behind sand barriers along the border fence. The soldiers fired live bullets and tear gas canisters at them. The clashes that continued until the evening resulted in the injury of 2 civilians, including a child. At approximately 13:30 on Thursday, 05 April 2017, dozens of Palestinian civilians gathered to the east of Malakah intersection, east of al-Zaitoun neighborhood, east of Gaza City to participate in the “Great March of Return and Breaking Siege”. They threw stones at Israeli soldiers stationed along the border fence between the Gaza Strip and Israel. The soldiers fired live and rubber bullets and tear gas canisters at the protestors. As a result, 2 civilians were wounded. At approximately 16:30 on the same Thursday, Israeli forces stationed behind a sand barrier that is 50 meters away from the eastern side of the border fence between the Gaza Strip and Israel, northeast of Jabalia in the northern Gaza Strip, opened fire at dozens of Palestinian children and young men, who were about 50 to 150 meters into the west of the border fence, participating in the “Great March of Return and Breaking Siege” that was organized on the 42nd Anniversary of the Land Day. As a result, 2 civilians were wounded. One of them was hit with a live bullet to the lower limbs and the other was hit with a tear gas canister to the head. They were transferred to the Indonesian Hospital and doctors classified their injury as moderate. Around the same time, Israeli forces stationed behind the border fence between the Gaza Strip and Israel, east and north of the demonstration spot, east of Khuza’ah village, east of Khan Yunis in the southern Gaza Strip, fired live bullets and tear gas canisters at a group of demonstrators who set fire to tires in the area, attempted to approach the border fence and threw stones at the Israeli forces stationed behind sand barriers 30 meters behind the border fence. Clashes with the Israeli forces continued until approximately 19:00. As a result, 3 civilians, including a child, were hit with live bullets to the limbs. They were transferred to Gaza European Hospital. Doctors found that the child was hit with an explosive live bullet to the right leg and they had to amputate it from below the knee. At approximately 17:00 on the same Thursday, Israeli forces stationed behind sand barriers, east of the border fence between the Gaza Strip and Israel, east of al-Shawkah village, east of Rafah in the southern Gaza Strip, opened fire at dozens of Palestinian children and young men who participated in the “Great March of Return and Breaking the Siege” that was organized on the 42nd Anniversary of the Land Day. As a result, a child was hit with a live bullet to the head. Early on Friday, 06 April 2018, hundreds of Palestinian civilians, including women, children and entire families started swarming to the sit-in spot in the Return Camp established by the Supreme National Authority for the Great March of Return and Breaking Siege, east of Khuza’ah village, east of Khan Yunis. 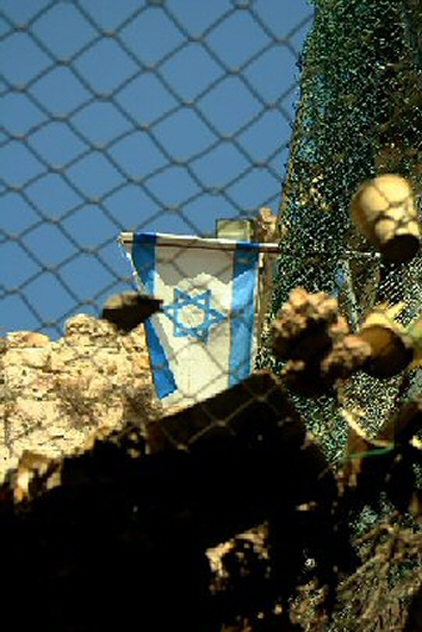 The Camp is wrapped by the border fence from the eastern and northern side at a distance ranging from 250 to 500 meters. Following the Friday prayer, the number of the participants amounted to thousands of men, elderlies, women and children in the demonstration yards and out of them, raising the Palestinian flags and chanting national slogans. Dozens of them approached the border fence with Israel, set fire to tires and attempted to throw stones at the Israeli forces. A number of the protestors approached the first fence that is located in the Gaza Strip lands around 50-70 meters away from the main border fence. Osama Khamis Musalam Qudeih (38) from ‘Abasan al-Kabirah, east of Khan Yunis was hit with a live bullet to the head at approximately 14:50, while participating in the demonstrations near the border fence, northeast of the demonstration yard, causing his immediate death. Yasser Abdul Rahman Mustafa Murtaja (30), a photojournalist at ‘Ain Media Production Company from Gaza City was hit with a live bullet to the left side of the abdomen while he was covering the second Friday’s events of the Great March of Return. According to PCHR’s investigations, at approximately 13:45, Murtaja was hit with a live bullet to the left side of the abdomen, causing a rupture in the main artery of the intestines. Murtaja was shot to the weakest point in the vest Marked “Press” he was wearing while he was taking photos of the demonstrators around 150-200 meters away from the border fence, northeast of the demonstration yard. Murtaja was transferred via an ambulance to Nasser Hospital in Khan Yunis. Doctors found that Murtaja suffered severe bleeding in the abdomen and an artery completely cut, so he was admitted to the OR. Murtaja stayed at the hospital receiving the medical treatment until his death was announced at approximately 01:20 on Saturday, 07 April 2018. Moreover, 143 civilians, including 23 children, 2 women, a journalist and a paramedic, were wounded. Among them, 111 were hit with live bullets and their shrapnel, 3 civilians were hit with rubber bullets and 29 others were directly hit with tear gas canisters. 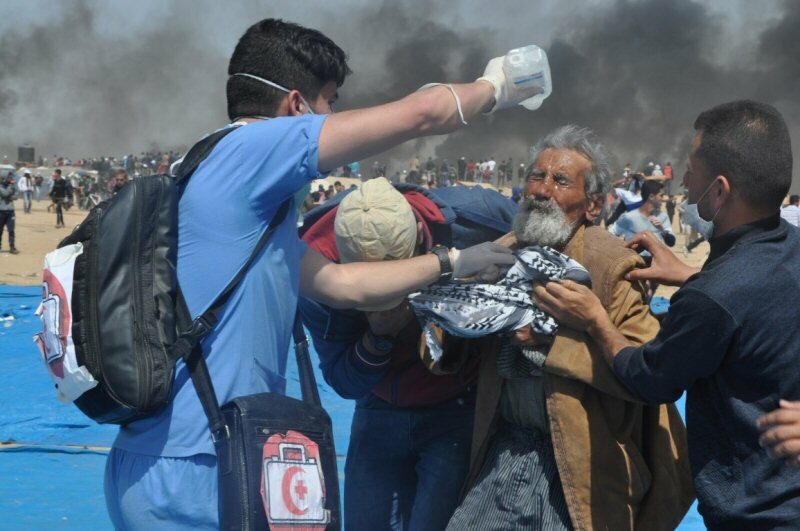 All the wounded civilians were taken to 2 field hospitals in the camp belonging to the Ministry of Health and Palestinian Red Crescent Society (PRCS). Some of them were then transferred to Nasser, Gaza European and Algerian Hospitals in Gaza. Doctors classified the injury of 9 civilians as serious. At approximately 08:00 on the same Friday, ten thousands of civilians, including women and children, within entire families participated in the “Great March of Return” established by the Supreme National Authority for the Great March of Return and Breaking Siege. They headed to Malakah intersection, east of al-Zaitoun neighborhood, east of Gaza City. Some of them set fire to tires near the border fence between the Gaza Strip and Israel in an attempt to block the vision of Israeli soldiers stationed behind sand barriers and avoid the live and rubber bullets and tear gas canisters. However, the Israeli forces continued targeting the demonstrators by heavily opening fire and firing tear gas canisters at them. As a result, Husein Mohammed ‘Adnan Madi (14) was killed after being hit with a live bullet to the abdomen (below the heart). Moreover, 151 civilians, including 16 children and 4 women, were wounded. One hundred and thirty seven of them were hit with live bullets and 14 civilians were hit with rubber bullets. The wounded civilians were transferred to al-Shifa and al-Quds Hospitals in Gaza City. Doctors classified the injury of 5 civilians as serious. At approximately 08:30, hundreds of Palestinians made their way to the border fence between the Gaza Strip and Israel in the northern Gaza Strip. They gathered about 50 to 150 meters into the west of the border fence. They set fire to tires and threw stones at Israeli soldiers stationed behind a sand barrier, 100 meters to the east of the abovementioned border fence. The soldiers fired live bullets, rubber-coated metal bullets and tear gas canisters at the protestors. The clashes continued until the evening. As a result, Majdi Ramadan Mousa Shabat (38) from Beit Hanoun was killed after being hit with a live bullet to the neck. Moreover, 168 civilians, including 20 children, one women, journalist Ibrahim ‘Emad Mohammed al-Za’noun (21) who was hit with a live bullet to the left hand, and 2 paramedics, were wounded. Among those wounded, 139, including 14 children, were hit with live bullets; 28 civilians, including 6 children and a woman, were directly hit with tear gas canisters, and one civilian was hit with a rubber bullet. The wounded civilians were transferred via ambulances belonging to the PRCS, Medical Services, the Union of Health Work Committees and the Ministry of Health to the Indonesian, al-Awda, Kamal Edwan Hospitals. Doctors classified the injuries of 6 civilians as serious. Mohammed Sa’id Mousa al-Haj Saleh (33), was hit with 2 live bullets to the abdomen and chest. ‘Alaa’ Edeen Yahiya Ismail al-Zameli (16) was hit with a live bullet to the neck. Moreover, 77 protestors, including 7 children, were wounded and doctors classified the injury of 8 of them as serious. Among those wounded were journalists Khalil Ibrahim Abu ‘Aathrah (35), who was hit with a live bullet to the left thigh, and ‘Alaa’ Abdul Fattah Ibrahim al-Namlah (35) who was hit with live bullet shrapnel to the right arm; in addition to paramedics Murad Ismail Husein al-Najjar (35), who was hit with live bullet shrapnel to the legs, and Abdul Razeq Ibrahim Ejme’an Abu ‘Athrah (35) was hit with live bullet shrapnel to the right leg. At approximately 09:00 on the same Friday, Palestinian protestors started swarming to camps established by the Supreme National Authority for the Great March of Return and Breaking Siege, 700 meters away from the border fence between the Gaza Strip and Israel, east of al-Buraij in the central Gaza Strip. At the end of Friday prayer, the number of participants increased as thousands of men, women and children arrived at the area. Hundreds of young men and children approached the border fence. They set fire to tires and threw stones at Israeli soldiers stationed at sand barriers, 30 meters away from the border fence. The soldiers sporadically fired live and rubber bullets and tear gas canisters at the protesters and the other participants who gathered about 300 meters away from the western side of the border fence. The clashes continued until approximately 20:00. As a result, 2 demonstrators were killed namely Ibrahim Zeyad Salamah al-‘Aar (20) from al-Nuseirat was hit with a live bullet to the head, and Sedqi Taleb Mohammed Abu ‘Etaiwi (45) from al-Nuseirat was hit with a live bullet to the neck. Moreover, 35 civilians, including 6 children and a woman, were wounded. Thirty three of them were hit with live bullets and 2 others were hit with rubber bullets. Those wounded were transferred via PRCS ambulances to al-Aqsa Hospital in Deir al-Balah. Doctors classified the injury of 2 civilians as serious and transferred them to al-Shifa Hospital in Gaza City. At approximately 00:30 on Saturday, 07 April 2018. Medical sources announced the death of one of the 2 wounded namely Hamzah ‘Eid Ramadan Abdul ‘Aal (28) from al-Zawaidah. Hamzah succumbed to his wounds after he was hit with a live bullet to the head. At approximately 14:00 on Saturday, 07 April 2018, Israeli forces stationed behind the border fence between the Gaza Strip and Israel, east of Malakal intersection, east of Gaza City, opened fire at dozens of Palestinian civilians who were participating in the activities of the “Great March of Return”. As a result, 3 civilians, including a child, were wounded. They were transferred to al-Shifa Hospital in Gaza City to receive medical treatment and doctors classified their injuries as moderate. At approximately 13:30 on Sunday, 08 April 2018, Israeli forces stationed behind the border fence between the Gaza Strip and Israel, east of Malakah intersection, east of Gaza City, opened fire at dozens of Palestinian civilians who were participating in the activities of the “Great March of Return”. As a result, 2 civilians, including a child, were hit with live bullets. They were transferred to al-Shifa Hospital in Gaza City to receive medical treatment and doctors classified their injuries as moderate. At approximately 16:30 on the same Sunday, Israeli forces stationed behind a sand barrier 50 meters to the east of the border fence between the Gaza Strip and Israel, northeast of Jabalia in the northern Gaza Strip, opened fire at dozens of Palestinian children and young men, who were about 50-150 meters into the west of the border fence participating in the activities of the “Great March of Return” that was organized on the 42nd Anniversary of the Land Day. As a result, 4 civilians, including a child, were wounded. Two of them were hit with live bullets while the 2 others were hit with live bullet shrapnel. Doctors classified their injuries as moderate. At approximately 18:00 on the same Sunday, Israeli forces stationed behind the border fence between the Gaza Strip and Israel to the east and northeast of the demonstration yard, east of Khuza’ah village, east of Khan Yunis in the southern Gaza Strip, fired live bullets and tear gas canisters at the protestors, who set fire to tires while some of them attempted to approach the border fence. As a result, 2 civilians, including a 13-year-old girl, were wounded. They were transferred to the Gaza European Hospital, where Doctors found that the girl was hit with shrapnel to the neck and classified her injury as minor. As for the other civilian, he was hit with a live bullet to the right foot and his injury was classified as moderate. At approximately 12:00 on Monday, 09 April 2018, Israeli forces stationed behind the border fence between the Gaza Strip and Israel, north and northeast of the demonstration yard, east of Khuza’ah village, east of Khan Yunis in the southern Gaza Strip, sporadically fired live bullets and tear gas canisters for 8 hours at a group of protestors who were in the vicinity of the camp as some of them attempted to approach the border fence. As a result, 7 civilians, including a child, were hit with live bullets to the lower limbs. They were transferred to Gaza European Hospital and doctors classified their injuries as minor. The wounded civilians received medical treatment and then left the hospital. At approximately 16:30 on the same Monday, Israeli forces stationed behind a sand barrier around 50 meters away from the eastern side of the border fence between the Gaza Strip and Israel, northeast of Jabalia in the northern Gaza Strip, opened fire at dozens of Palestinian children and young men who were about 50-150 meters into the west of the border fence participating in the activities of the “Great March of Return” that was organized on the 42nd Anniversary of the Land Day. As a result, a 28-year-old civilian was hit with a live bullet to the right leg. At approximately 17:15 on the same Monday, Israeli soldiers stationed behind the border fence between the Gaza Strip and Israel, east of al-Buraij in the central Gaza Strip, randomly fired live bullets and tear gas canisters at a group of journalists and 2 PRCS ambulances that were in the vicinity of Jakar Street, which is around 300 meters away from the border fence. The journalists were organizing a sit-in protesting the killing of their colleague Yasser Murtaja by the Israeli forces on 06 April 2018, east of Khuza’ah village, east of Khan Yunis. As a result, Emad Salah Taleb al-Boheisi (34), an ambulance officer from Deir al-Balah, was hit with a live bullet to the right leg. According to PCHR’s investigation, Emad and his colleague were in the ambulance as usual to transfer those in the daily clashes between the Israeli forces and Palestinian young men within the “Great March of Return” activities. The firing occurred when twenty young men were near the security fence and a number of journalists were organizing the sit-in protesting the killing of their colleague. At approximately 17:15, the Israeli soldiers randomly fired tear gas canisters, so everyone fled away from the area. Emad and his colleague drove to the north, leaving behind the litter they use to carry those wounded. The driver stopped and came back to bring the litter. When he returned and opened the ambulance door, the Israeli soldiers randomly opened fire at the journalists and the ambulance. As a result, ‘Emad was hit with a live bullet to the right leg. Emad’s colleague immediately took him out of the car and put him on the litter to offer him first aid along with their colleagues, who then took him to al-Aqsa Hospital in Deir al-Balah. Emad. He was then transferred to al-Quds Hospital in Gaza City where he underwent a surgery. At approximately 14:00 on Tuesday, 10 April 2018, Israeli forces stationed behind the border fence with Israel into the east and northeast of the camp, east of Khuza’ah village, east of Khan Yunis in the southern Gaza Strip, sporadically fired live bullets and tear gas canisters for 5 hours at a group of protestors, who were in the vicinity of the demonstration camp as some of them attempted to approach the security fence. As a result, a civilian was hit with a live bullet to the neck and then transferred to Gaza European Hospital, where doctors classified his injury as moderate. At approximately 17:30 on the same Tuesday, Israeli forces stationed behind a sand barrier about 50 meters away from the east of the border fence between the Gaza Strip and Israel, northeast of Jabalia in the northern Gaza Strip, opened fire at dozens of Palestinian children and young men, who were about 50 to 150 meters away from the western side of the border fence participating in the “Great March of Return and Breaking the Siege” on the 42nd Anniversary of the Land Day. As a result, a 28-year-old civilian from Jabalia was hit with a live bullet to the left leg. At approximately 08:00 on Wednesday, 11 April 2018, Israeli forces stationed along the border fence between the Gaza Strip and Israel fired 3 smoke grenades at the Return camp established in Malakah area, east of al-Zaitoun neighborhood, east of Gaza City. As a result, a 61-year-old civilian was hit with shrapnel to the back. At approximately 10:40 on the same Wednesday, Israeli forces stationed along the border fence between the Gaza Strip and Israel, north of the landfill area, north of Beit Hanoun in the northern Gaza Strip, opened fire at a group of Palestinian young men who approached the border fence. As a result, a 19-year-old civilian from Beit Hanoun was hit with a live bullet to the thighs. He was transferred to the Indonesian Hospital, where doctors classified his injury as moderate. Three Palestinian civilians succumbed to wounds they sustained earlier on the first Friday on the “Great March of Return and Breaking the Siege” that was organized on the 42ndAnniversary of the Land Day coinciding 30 March 2018. At approximately 11:30 on Thursday, 05 April 2018, medical sources at the Gaza European Hospital in Khan Yunis announced the death of Shadi Hamdan ‘Ali al-Kashef (34), from al-Shawkah village, east of Rafah in the southern Gaza Strip, succumbing to previous wounds he sustained. Shadi, who is a deaf-mute, was hit with a live bullet to the head on Friday, 30 March 2018, during his participation in the “Great March of Return and Breaking Siege” in al-Shawkah village near the border fence between the Gaza Strip and Israel. At approximately 06:30 on Friday, 06 April 2018, medical sources at al-Shifa Hospital in Gaza City announced the death of Tha’er Mohammed Abdul Ra’ouf Rab’aah (30) from Jabalia in the northern Gaza Strip, succumbing to previous wounds he sustained. Tha’er was hit with a live bullet to the thighs on Friday, 30 March 2018, during his participation in the “Great March of Return and Breaking Siege”, east of Abu Safia Hil, east of Jabalia. As a result, the artery in the right thigh was cut, causing Tha’er a severe bleeding, and was taken to the Indonesian Hospital. Due to his serious injury, Tha’er was referred to to al-Shifa Hospital where he stayed in the Intensive Care Unit (ICU) until his death was announced. At approximately 03:30 on Monday, 09 April 2018, medical sources at the Gaza European Hospital announced the death of Marwan ‘Awad Hamad Qdaih (45) from Khuza’ah village, east of Khan Yunis, succumbing to his previous wounds. According to PCHR’s investigations, Marwan was hit with 2 live bullets to the legs at approximately 14:30 on Friday, 30 March 2018, when Israeli forces targeted the protestors in the vicinity of the demonstration yard in Khuza’ah village. He was transferred to the Gaza European Hospital and doctors classified his injury as serious. The explosive live bullets caused a cut in the veins and arteries, severe laceration and fracture in the legs’ bones in addition to severe bleeding. Thus, Tha’er was admitted the Intensive Care Unit (ICU) and left it later. After 5 days, a vein exploded in the wounded, part causing new bleeding, so Tha’er was again admitted to the ICU and received 60 blood units and the the wounded part were infected. Tha’er’s health condition deteriorated until he succumbed to his wounds. It should be noted that Tha’er was married with 7 children. Khaled Rweidi and their siblings and the house was rented by ‘Atah Rweidi. Heirs of late ‘Atallah Suliman Rweidi. Faisal Rweidi sheltering 13 members. Mahmoud ‘Atallah Rweidi said to PCHR’s fieldworker that the Israeli forces imposed a complete closure in the area of al-‘Ain Street and then closed all streets leading to the above mentioned houses. They then raided the houses and forcibly expelled the residents after confiscating their cell phones. The Israeli workers vacated all the houses’ contents and changed the houses locks. After that, verbal quarrels erupted between the residents and Israeli soldiers, who pushed and beat the residents to force them to leave their houses. Mahmoud said that Elad Settlement Association has attempted for 3 years to seize the houses, claiming that his brother Rezeq sold the houses to the association before he was killed by unknown persons. Since then, the family submitted papers to prove that Rezeq did not own the houses and he was only living in his father’s house, which is the inheritance of seven brothers, and he has no right to sell these houses. Mahmoud added that in another plan to take over the houses, the association alleged that Rezeiq was indebted to it and when he declared his bankruptcy, the association agreed with the appraiser appointed by the District Court in the bankruptcy file to waive all houses to the association. Mahmoud also said that the family challenged to the agreement between the association and the appraiser, clarifying that the houses’ ownership belong to many persons not only to Reziq. He said that “though the case is pending in the court, we were surprised with the house raids and evacuation” The appraiser claimed that the District Court ordered the family 2 weeks ago to pay NIS 100,000 to the court in order to stop vacating the houses. He clarified that his lawyer did not tell them about the court’s demands and they were surprised with the house raids and evacuation. He also said that if the lawyer told us the court’s demands, we would do our best to raise the money to preserve our houses, but unfortunately the houses are under the Israeli settlers control and we were expelled from them. He stated that the family’s lawyer headed to the Supreme Court to submit an urgent appeal and ask the court to stop vacating the houses. The Supreme Court issued a decision to stop the vacating, but the Israeli officers claimed that the vacating ended before the decision was issued. Thus, the houses will remain empty and cannot be accessed by the owners until the final decision of the Supreme Court. At approximately 22:00 on Monday, 10 April 2018, Israeli forces backed by military vehicles and accompanied with 3 vehicles of the Israeli Civil Administration and a mounted-crane truck moved into Kherbit Zanoutah, southwest of al-Dahiryia village, south of Hebron. The Israeli forces deployed between houses and prevent the residents’ movement. After that, Israeli workers, who accompanied the Israeli forces, dismantled and confiscated the contents of Somoud and Tahadi School established by the residents in cooperation with ACF. The school was built on an area of 120 square meters and built of tin plates. Around 33 students were learning in the school since it was opened on 25 March 2018. The Israeli Civil Administration officers handed the school a notice to stop the construction works and a list of the confiscated items before leaving. It should be noted that Kherbit Zanoutah is located near “Shim’a” settlement and Bypass Road (60) that connects the Israeli settlements established on the southern lands of Hebron and the northern West Bank. Kherbit Zanoutah is an agricultural community, whose population increases in spring and decreases in summer. It is inhabited by 26 families, including 180 people. Its residents work in breeding livestock and planting their lands. In the past years, the Israeli forces threatened the residents of Kherbit Zanoutah to deport them. Many hearings were held in the Israeli courts calling the Israeli government to deport those residents and find another place for them. Kherbit Zanoutah has been exposed to a fierce campaign by the Israeli authorities, in which the Israeli forces demolished wells and notified many barracks, which shelter thousands of livestock, to demolish them. The residents may resort to leaving these barracks if they were displaced. At approximately 06:30 on Tuesday, 10 April 2018, Israeli bulldozers demolished an under-construction residential house in al-Qastal al-Jabaliyia area in Jebiyia village, northwest of Ramallah, under the pretext of non-licensing. The house belongs to Ghazi Mohamed ‘Ali Hejazi (58), from Kafur ‘Aqoub village, north of occupied East Jerusalem. The house’s owner said that the Israeli forces accompanied with the Israeli Civil Administration crews moved into the village, surrounded his house, and then demolished it without a prior warning. He added that at approximately 06:30, he received a phone call from his friend Saber Shalash, who informed him that the Israeli forces raided his house and demolished it. Ghazi said that at approximately 07:30, he arrived at his house and found it completely demolished. He clarified that his 250-square-meter house was built on 10 January 2018 and he attempted to get a license from the Israeli authorities, but in vain. It should be noted that house was supposed to shelter 8 persons. Israeli Ambassador to Ghana Ami Mehel angrily denying the existence of Palestine in a radio interview yesterday following Israel’s decision to bar a Ghana MP from entering the country this week. Mehel flew into a rage after being questioned by a journalist as to why Ghanaian parliamentarian Ras Mubarak was prevented from entering the occupied territories via the Allenby Crossing, despite having been granted a visa. The use of the term “oPt”, an acronym for the occupied Palestinian territories, prompted Mehel to refuse to answer the question if the journalist used such terminology. The ambassador denied that Mubarak had been granted a permit to enter the country and claimed that the MP was told to wait while Israeli authorities investigated the situation but that he left the crossing early of his own accord. Mehl further claimed that Mubarak had lied about the incident because he is “a propaganda machinery of the Palestinian authorities”. “He never asked for a visa … its b******t, its propaganda!” Mehl insisted, before being asked to control his language. Mubarak, a vocal supporter of the Palestinian cause, was travelling to Ramallah to deliver a speech at the invitation of the Palestinian Authority (PA). Yesterday, he was forced to address the delegates at the 9th Jerusalem International Conference via teleconferencing. He said that despite his disappointment that he could not join the conference in person, his experience of being denied entry was “a tiny taste of the oppression of the Palestinian people”. He also referenced current events taking place in the Gaza Strip, with Israeli forces violently quashing peaceful protests on the border. “Any country which treats international laws and conventions with contempt, flouts them with increasing regularity and maintains a brutal military occupation has to fit into the rogue state category. Israel is not just a rogue state, it is a terrorist state. The politics of discrimination and apartheid should have no place to thrive in this 21st century,” he said. Mubarak is now one of a growing list of African parliamentarians and dignitaries that have been denied entry to Israel following their involvement in pro-Palestinian activism. In April 2015, South Africa’s Minister of Higher Education, Blade Nzimande, was denied entry on route to Ramallah, where he was expected to facilitate research collaboration between the University of Johannesburg and Palestinian academics. In December 2016, Associate General Secretary for the World Council of Churches (WCC), Dr Isabel Apawo Phiri from Malawi, was also banned; she was the sole African member of the delegation that was due to meet in Jerusalem, and the only one refused entry. Doctors in the occupied Gaza Strip were forced to amputate the legs of two Palestinians shot in recent protests, after Israeli authorities denied them transfer to a hospital in the West Bank. Israeli authorities explicitly referenced the two youths’ participation in recent mass protests as the reason why the request was rejected. According to legal rights centre Adalah, 20-year-old Yousef Karnaz and 17-year-old Mohammad Al-‘Ajouri were shot and wounded by Israeli snipers on 30 March during mass Great Return March protests. Gaza’s Shifa Hospital, “which had no means to rescue the wounded men’s legs”, referred them to Al Istishari Hospital in Ramallah on 1 April, and a request to exit Gaza and transfer to Ramallah was submitted to the Israeli military on the same day. Only after an intervention on 4 April by Adalah and Gaza-based rights group Al-Mezan, however, did Israeli authorities respond, rejecting the requests. In doing so, Adalah described, “the state detailed a punitive policy designed to prevent wounded from leaving Gaza for medical care due to their alleged participation in a protest”. The Israeli Supreme Court is today considering the case, since one of the two youths may need another amputation if he does not receive treatment in Ramallah. The state’s response indicates that Israel’s policy is to prevent those in danger of losing organs from leaving Gaza for medical treatment, in order to punish them for participating in a non-violent protest. Israeli authorities announced yesterday that the residents of Umm Al-Hiran, an “unrecognised” Bedouin village in the Negev targeted for demolition, have signed a relocation agreement. But local residents and rights activists decried the deal as effectively signed under duress, in light of authorities’ declared intention of destroying the village to make way for a new Jewish community. According to the agreement, Umm Al-Hiran residents will be relocated “to a community adjacent to the Bedouin town of Hura”, which must take place by September. They will also receive (an unspecified) amount of compensation for their current homes. Haaretz cited a source “involved in the negotiations”, who said they were conducted late Tuesday night, and involved the commander of the police’s Southern District. The chair of the Umm Al-Hiran residents’ committee, Ra’ad Abu Alkiyan, told Haaretz that the villagers signed the pact because they had no alternative. I would have been satisfied to remain in my home, but this agreement means there are no more losses, no more crying mothers, no more blood and no more pain. If you don’t sign, we’ll come to demolish. In March, Israeli authorities declared that they would carry out forced evictions of the village’s residents by the end of April. Last year, hundreds of police officers stormed the village, shooting to death local maths teacher Ya’akub Abu Alkiyan as he was driving. Adalah – The Legal Centre for Arab Minority Rights in Israel, who has represented residents of Umm Al-Hiran for 15 years during their legal battle, decried “the most extreme and patently illegitimate pressure from Israeli authorities” applied to residents during “recent negotiations”.